Newly manufactured hunting or self-defense ammunition with boxer-primed aluminum casings sporting CCI's jacketed hollow-point bullets. The CCI JHPs are designed to achieve uniform ballistics performance while at the same time providing high-impact energy transfer and controlled expansion upon impact. 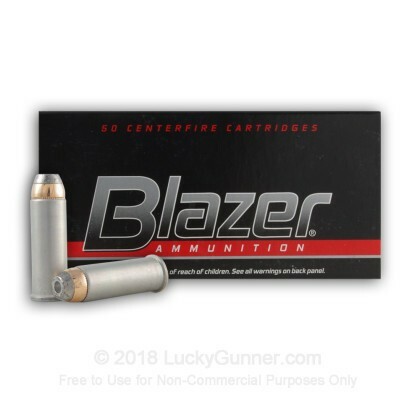 This ammunition is both economical and reliable and is backed by the reputation of a well-established brand. It is manufactured in the United States by CCI, a subsidiary of ATK, the largest ammunition manufacturer in the United States. While aluminum casings are not recommended for reloading, the ammunition provides great value in that it performs comparably to brass-cased ammunition but at a lesser cost. 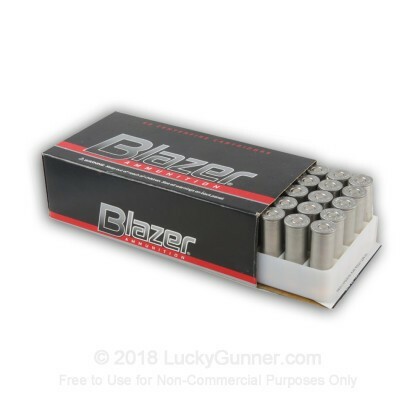 Ordered this ammo as it is what I have used for a long while and then couldn't find it locally. After spending Thousands of Dollars literally in search of the best performing 44 Magnum for my Desert Eagle, I finally found the Ammo that does not misfire and the recoil is much tolerable! I tried all brands including Federal, Remington, Megtech, and many other brands I finally found the Ammo that I had to choose in the beginning! I buy ALL my Ammo. from Lucky Gunner. they have the best customer service and all are honest!!! Other than being a non reloadable round these are a good value. Recoil is not an issue in my 1894C. They fed well and were as (or more) accurate. than the shooter. No misfires in the first box which is all I have shot so far. And as usual LG customer service is second to none. For a one time shot not bad. But you can still buy brass at a good price. All in All lucky Gunner they have the best overall price and product. Thanks! C.S.R. From Michigan. This ammo shoots very well in all calibers.Too bad alum cases cannot be reloaded.ACCURATE. good product,great delivery time,great price! makes my second order of 1000 rds or more pleased with both shipments at prices that let even a poor guy stockpile some ammo! this was the second purchase from LuckyGunner and another great transaction....Thanks for the quick shipping and easy of buying will be back for more! This ammo is a great value for the money. It has worked well for me and the low price allows me to use it for practice shooting. The aluminum shell does not permit reloading, which is fine for me as I don't reload. good product,great service although shipping cartons could have been a little better prepared. product was almost coming out of shipping cartons.other than that truely satisfied would and will order again. 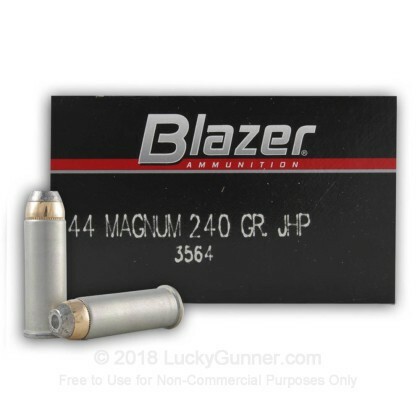 We also have this 44 Mag - 240 gr JHP - Blazer - 1000 Rounds ammo in stock in a bigger quantity.